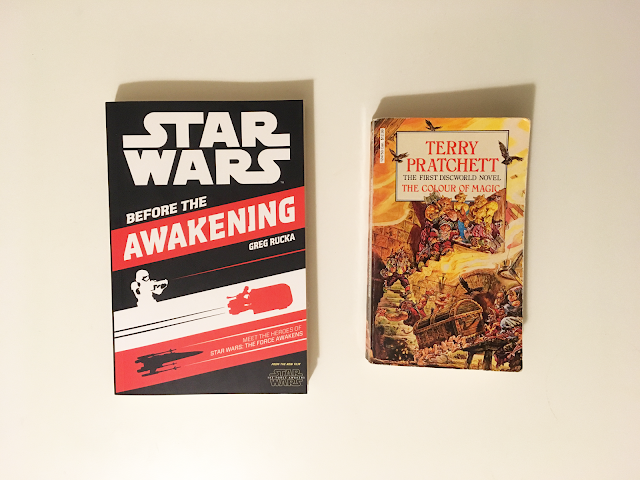 Star Wars: Before the Awakening by Greg Rucka - If you're looking for high, lofty literature, this is not for you, but if you're looking for some fun backstory to fill that post-Force Awakens gap in your heart, give Before the Awakening a go. This volume collects three stories for each main character from The Force Awakens: Finn, Rey, and Poe. We hear about Finn's first moments of questioning being a Stormtrooper, we learn about Rey's scavenging and trust in herself, and we travel along with Poe during events that lead directly up to the beginning of the film as he uncovers a First Order plot. It's a fun and fast read which is definitely directed towards a younger readership, but could probably be enjoyed by someone of any age who loves Star Wars. The Colour of Magic by Terry Pratchett - I first read this when I was in sixth form and absolutely adored it, but all of these years later I couldn't tell you what on earth happened in the story. That was, until a few days ago when I re-entered the Discworld, fully intending to finally read further into the series. Goddamn, I loved this book even more the second time round, and found myself chuckling at every other line. It's hard to sum up what happens in this story but I'll give it a try: Rincewind the wizard is charged with caring for an exotic tourist, Twoflower, and his sentient luggage. Chaos ensues, as expected. I don't know why anyone wouldn't enjoy Pratchett's writing. It's sharp and witty, and uses humour in ways I wouldn't even be able to imagine myself. The definition of a 'page-turner'.